Emerging out of the cold and monochromatic cloak of winter, the bright colors of spring offer hope of renewal and vibrant new life. But for all its beauty, the weather in this season is challenging—chaotic, unpredictable—symbolic of the uncertainty inherent in most transitions. What anchors us during these uncomfortable and challenging periods of change? The humanities offer us lifelines of history, language, poetry, and art that celebrate the persistence of the seasons and remind us how others have navigated similar feelings of doubt and ambiguity. In our current age, many lament their struggles to maintain emotional depth in the midst of socioeconomic and political uncertainties. Yet, historians remind us this concern is not new, but a common thread of discourse inherent in all societal structures, from the periods of Aristotle and Socrates to the 21st century. Throughout time, the humanities have provided a framework not just to weather seasonal shifts but to celebrate our shared stories of meaning-making. Although change may be the only true constant, radical upheaval is often sparked at the margins of our lived experiences. Agents of change are frequently those individuals or communities who creatively and courageously delve into the unknowable, searching for a new perspective. Powerful drivers of shifting perspectives are often uncovered through critical examination of theory, practices, or professions, challenging the status quo with a goal toward transformation. Are our current practices in research and teaching adequate to sustain our rehabilitation professions through a progressively complex, globally inter-related, and dynamic system of care? To effect change as teachers, how do we nourish discernment in our students, and in ourselves? There are no simple answers to the difficult questions, such as these, that we face as individuals and as rehabilitation professions across time; yet, it is in the asking where the opportunities for progress lie. Certainly, one of the defining characteristics of a truly effective educator is the ability to teach students how to ask good, genuinely curious, and deeply thoughtful questions. Perhaps as a collection of rehabilitation science professions, we can open the door to the “critical theory teacher” and learn that discomfort and struggle need not be perceived negatively, but simply as a sign of living at the edge of our threshold of change, leaning into the questions themselves. To create a space for this type of progressive questioning, we are excited to offer a new submission category to JHR: Critical Research and Perspectives. Co-edited by Jenny Setchell, PhD, BScPT, and Barbara Gibson, PhD, BMR(PT), this section will address research and scholarship articles that employ critical perspectives on rehabilitation. In particular, we are seeking submissions that apply critical, post-structural, or postmodern theories including original research, thought pieces, and theoretical discussions of the philosophical basis of rehabilitation practices, education, and/or research. We are honored to have these two internationally recognized scholars join our Editorial Board! Dr. Setchell is a research fellow in international conjoint positions at the School of Health and Rehabilitation Sciences, The University of Queensland (Australia); and Bloorview Research Institute, Holland Bloorview Hospital, University of Toronto (Canada). She co-founded the international Critical Physiotherapy Network (CPN: https://criticalphysio.net) with Dr. Gibson and Dr. Dave Nicholls (Auckland University of Technology). Dr. Gibson, associate professor at the University of Toronto, is a physical therapist and bioethicist and holds the Bloorview Children’s Hospital Foundation Chair in Childhood Disability Studies with the Bloorview Research Institute in Canada. She has led the production of several books aimed at transforming rehabilitation practices, including Rethinking Rehabilitation Theory and Practice (2015, co-editor); and Rehabilitation: A Post-Critical Approach (2016). She is the lead editor on Manipulating Practices: A Critical Physiotherapy Reader (2018). In the inaugural article in our new Critical Rehabilitation Research and Scholarship section, Dr. Gibson discusses her book, Rehabilitation: A Post-Critical Approach, an artfully explained introductory text for the rehabilitation science audience, designed to help them engage with critical social theories, providing a framework for thinking through the application of these ideas to research and practice. In this Spring 2018 issue of JHR, we are pleased to share articles that explore a wide range of creative thinking, to offer new insights into the concept of healing itself. From our Historical Perspectives in Art section, Rebecca R. Stone, PhD, provides a sensitive interpretation of ancient Central and South American artifacts, exploring how other cultures may view those living with disabilities in contrast to our current medical and societal perspectives. Sarah Smith, SPT, and Kathy Lee Bishop, PT, DPT, report on Art with Heart, a creative program initiated by artist Wayland Moore following his own triple-bypass surgery, to address the healing of the minds and souls of recovering patients. Professor Julie Hengst, PhD, CCC-SLP, reviews Diane Ackerman’s book, One Hundred Names for Love: A Stroke, a Marriage, and the Language of Healing, which chronicles how the author responded to her husband’s aphasia and imaginatively engaged in his rehabilitation. In a tender account of his family’s fostering and later adoption of a physically traumatized infant born with neonatal abstinence syndrome, Chad Jackson, PT, DPT, OCS, details how a healthcare provider’s empathy, empowerment, and connection form a crucial aspect of the healing process. Partnering with Dr. George Huba, authors Phillip Kellogg, SPT, and Ali Nogi, PT, DPT, present an overview of the practice of Mind Mapping—a visual-thinking tool used for organizing information—illustrating the technique’s application in healthcare and rehabilitation. Jennifer Hastings, PT, PhD, NCS, offers a descriptive study of the lived experience and psychosocial implications of an individual with tetraplegia who developed new-onset neuromuscular scoliosis and sought non-invasive treatment with a wheelchair seating specialist. Eileen P. Anderson-Fye, EdD, and colleagues review the lessons learned in the development of a pilot undergraduate survey course offering an overview of interdisciplinary approaches to medicine and health across the humanities and social sciences, and encouraging unique insights in students about the nature of the healing process. Through an original poem and commentary, Amanda LaLonde, PT, DPT, GCS, captures the feelings of frightened, defiant patients in an impersonal healthcare system, encouraging us to be mindful of the impact of language and how our words create opportunities to strengthen our interconnectedness and humanism in the therapeutic relationship. Congratulations to Creighton Doctor of Physical Therapy Program graduate student Hayley Rieger, the winner of the inaugural physical therapy student essay contest co-sponsored by the ACAPT Consortium for the Humanities, Ethics, and Professionalism (CHEP) and JHR! This writing competition is designed to encourage deep thinking by students about the role and value of humanities, ethics, and professionalism in academic training and professional life. The first in an annual series, the CHEP-JHR essay contest offers a creative opportunity to ignite critical reflection in PT students across the nation to support holistic approaches to patient care. This year’s prompt centered around the importance of getting to know our patients as individuals and creating a meaningful connection as a critical component of excellence in clinical practice. Students were asked to “write about a time when learning a non-medical piece of information led to an improved healthcare outcome and/or patient experience.” As CHEP steering committee member Donna Smith reflects: “Ms. Rieger’s vivid description of her experience with her patient underscores the transformative power of the therapeutic relationship…approaching our patients as partners in the healing process and through the lens of humility that allows their wholeness as human beings to be seen. Her words, ‘…she could teach me the lifelong lesson that helping someone to reach their full potential means hearing the song in their heart and finding a way to sing it back…’ expressed a simple but salient truth: we must always value our patients’ personhood and the gifts that arise from the shared experience of healing.” Essays from the two additional finalists, Mercedes Aguirre and Becky Mercuro, will be published in the Fall 2018 issue of JHR. Thank you for joining us. We hope you enjoy this issue of JHR, and find true insights within it to share with your community. If you are interested in submitting your work to JHR, please review our Submission Guidelines and Frequently Asked Questions sections. If you are considering being a reviewer, please contact Dr. Sarah Blanton: follow the Contact link, indicate the content area you are interested in reviewing, and attach your CV. 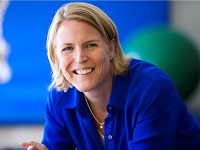 Dr. Sarah Blanton is an Associate Professor of Rehabilitation Medicine at Emory University School of Medicine, Division of Physical Therapy. She graduated from the University of Virginia in 1987 with a BA degree in biology, from Emory University in 1992 with her masters in physical therapy and received her clinical doctorate in physical therapy in 2003. She has a specialty certification in Neurology through the American Board of Physical Therapy. After nine years working in neurologic rehabilitation at Emory Center for Rehabilitation Medicine, she served as project coordinator for several research studies, including two multi-site, NIH-funded national clinical trials. In 2006, Dr. Blanton joined the faculty of the Emory Doctor of Physical Therapy program and her teaching has included geriatrics, mental health, cultural diversity and neurorehabilitation. Dr. Blanton’s current research focus includes stroke survivor and family quality of life, including depression, fatigue, caregiver/family functioning and post-stroke education. The long-term goals of her research efforts are to develop methods to support family focused rehabilitation approaches that facilitate the active integration of the caregiver throughout physical therapy practice. Dr. Blanton’s interest in the Journal of Humanities in Rehabilitation stems from her ongoing exploration of the intersections of creativity and spirituality to gain insight into the human experience of suffering, joy and mystery. In her teaching, she has found the use of narrative to be an exceptionally powerful tool to foster reflection and personal insight for both students and patients. In her research, she is incorporating multi-media formats to develop family education interventions in the home environment. A photographer since childhood, she has enjoyed sharing her artwork through exhibits at Emory University, speaking with chaplaincy students on “Reflections of Art and Spirituality in Appalachia” and as a guest contributor to the Public Radio show, On Being.